After the British army came to Menorca, they immediately started strengthening their defences. They didn‘t even wait till the signing of the Treaty of Utrecht since their dominion ensured them full control of the Mediterranean. So this fort was already built between 1710 and 1726. The Fort Marlborugh near Es Castell is rather small, but very sophisticated for its time. Its mission was to protect the southern flank of the Castle of Sant Felip, which in turn had to defend the Port of Maó. The fort's central square is a large pit excavated out of the stone and very well hidden as it is below ground level. The entrance is a tunnel that opens out to the southern shore of Cala Sant Esteve. You can visit the fort, the tour takes about 45 minutes. 5.00 p.am to 8.00 p.m.
Fort Marlborough is one of three forts. The others are the Castle of Sant Felip (ancient moats) and the Stuart Tower (Torre d'en Penjat = Hangman's Tower - Use your computer mouse to enjoy a panoramic view). (The guided tour around the Castle of Sant Felip takes a couple of hours. The fortress was destroyed by the Spanish in 1782. 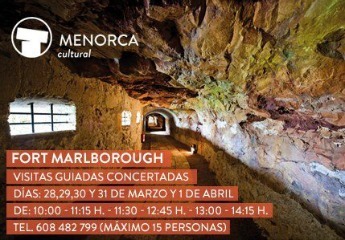 While on the tour, you‘ll learn about the history of many invasions, walk through lots of underground tunnels and will have great views of the port of Mao and La Mola).